After posting lame jokes online with the hashtag #lamejokesrule for the past few years, I found I had quite a collection of truly lame jokes. 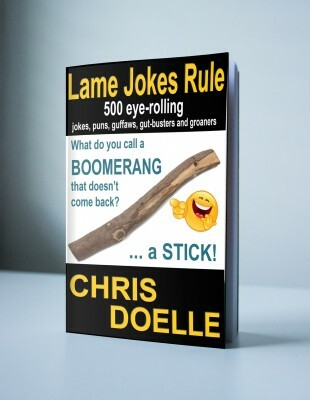 It was only natural that I would dig through them and pick out the best ones to put into my first joke book – Lame Jokes Rule: 500 eye-rolling jokes, puns, guffaws, gut-busters and groaners. 2 – Purchase direct at lamejokesrule.com (Purchase through Paypal and a link to a .mobi file (Kindle format) will be emailed to you. Be on the lookout for followup books as this series is just getting started. In the works are more volumes of Lame Jokes Rule as well as a specific compilation of puns. Thank you for laughing with me over the years and thank you for buying the book. If you have manners, thank your mom!